Pay your debt or forfeit your soul. ​ Mona thought her troubles were over, but little did she know, they were only just beginning. ​ When you owe a demon, they will always come to collect. Mona must enter the demon realm to repay her debt to the demon Adramelech. If she fails to complete her task, the forfeit is her soul. ​ Few have ever returned from the demon realm and those who have, are never the same. The realm is cruel, dark, and merciless, much like its inhabitants. ​ As if that wasn’t already enough, Mona must now deal with her growing feelings for the guys. (Yup, guys as in plural.) ​ Things can never just be simple for Mona. *This is book two in The Desdemona Chronicles. *This is a slow burn Reverse-Harem series. I loved A Demon’s Blade so I knew that I would enjoy A Demon’s Debt. And I can honestly say that CeCe blew A Demon’s Blade out of the water. CeCe has done a fantastic job of taking everything up a notch. 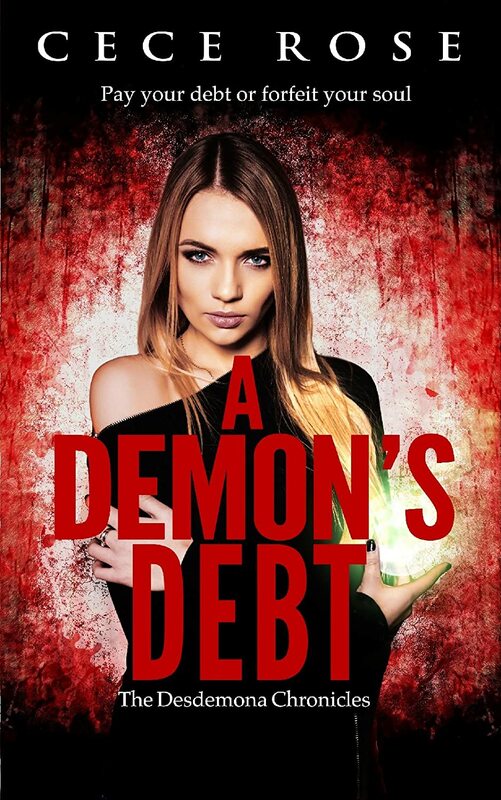 The characters, action and a well written plot will keep you reading A Demon’s Debt from beginning to end in one setting. I couldn’t put it down. Desdemona aka Mona is such a feisty fun character that I would want as a bff. Her snarky attitude, wit, loyalty, her determination to understand and use her power, and her growing attraction with the guys. And the guys, everyone of them are hot and uniquely perfect for her. Some of the guys in this one get a little more time with her, Mason and Nick aka Nicky. Nicky gets more time with Mona and I enjoyed every second of it, I believe he is my fave but it so hard to choose. They all are very likable in their own ways. Mason, Callan, Kaden, and Nick are even more protective of Mona, I love a good protective man, and they have reason to be. Owing the demon Adam a debt she is forced to travel to the demon realm and testify that she killed Alastor. There she meets some interesting demons, namely Prince Asmodeus, and she in turn makes quite the impression. When something unexpected happens she is forced to show her powers. That yes a Halfling does have magic. In a realm full of demons Mona is forced to play a game that could kill her. Now she asks herself who is a friend and who is her enemy. But one thing she does know, is that her guys, yes guys, have her back. And they will do anything to help her. I really cannot wait for An Angel's Defiance, to get some answers to questions I have, and to see the relationship between Mona and her guys grow even more. And what a development that happens at the end. We also get a lot more of Adam, is he using Mona or does he honestly feel something for her? I cannot rave about this book enough, it was just so freaking good. You will love this addition to the Desdemona Chronicles just as much as I did.